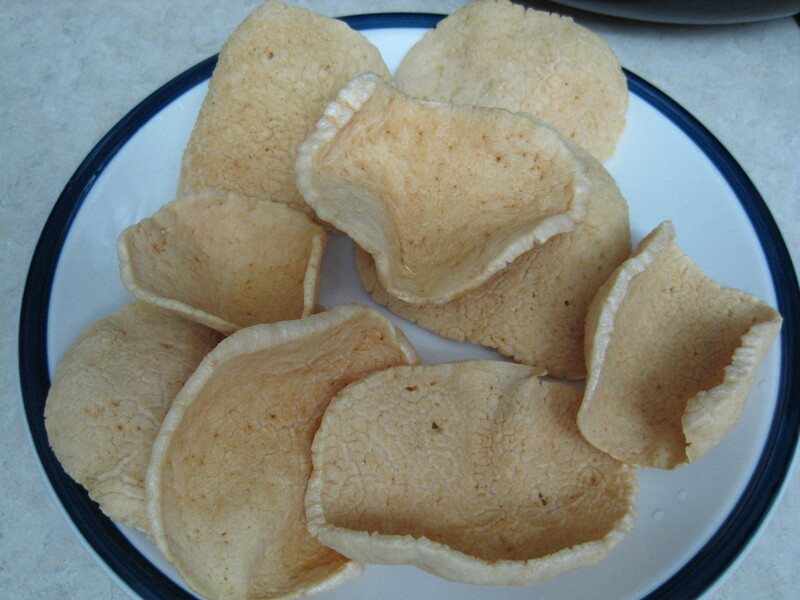 Shrimp chips (also known as prawn crackers) are light, puffed up, crunchy snacks that are very popular all around the world. In some North American Chinese restaurants, multi coloured (with food colouring) “shrimp chips” are served atop a deep fried whole chicken, but those shrimp chips almost never have any real shrimp in them. They taste like styrofoam and don’t resemble the real thing in flavour or in texture. The best shrimp chips in the world, in our opinion, are made in Brunei. It’s been many years since any of us were in Brunei, and I thought that I might never taste their shrimp chips again, until I discovered how easy they are to make at home. Malaysian shrimp chips are a very close second best in my opinion. Optional: MSG (monosodium glutamate) – Note: I don’t use MSG, but I’ve left it in the recipe in case others want to use it, because MSG makes the processed shrimp chips taste really good. The original recipe recommends 1 tsp of MSG. In the bowl of a food processor fitted with a metal blade, process the shrimp until it is a smooth paste. Then add the tapioca starch, salt, white pepper and MSG (if using) and process until well combined and a dough forms. Depending on the size of your food processor, you may need to do this in 2 batches. Then knead the dough on a silpat mat or lightly floured (using tapioca starch) surface until it is smooth and no longer sticky. This should only take a few minutes. If the dough is too sticky, add a bit more tapioca starch. If it is too dry, add a bit of water. Then set up your steamer and bring the water to rolling boil over high heat. (Here are detailed instructions for how to steam cook food. I use a steaming rack in a wok with a lid.) Meanwhile, roll the dough into two logs and place them on a lightly greased heatproof dish (I use a glass pie plate). Place them in the hot steamer and steam until cooked through, about 35 to 60 minutes depending on the thickness of the dough logs. You may need to replenish water in the steamer from time to time. Do not allow the wok to burn dry. Also, you may reduce the heat but maintain a rolling boil. The dough logs will expand slightly as they cook. 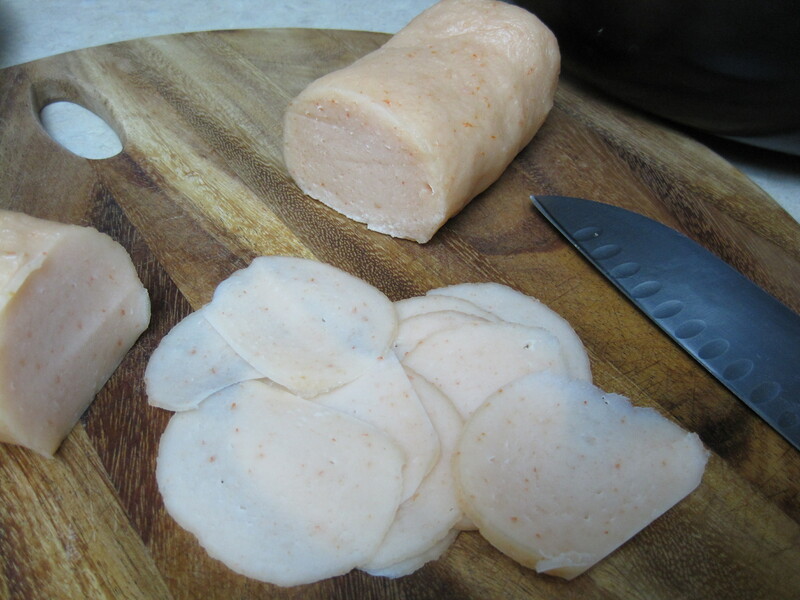 To test the doneness, cut a log in half crosswise and make sure that the colour is consistent throughout. Then transfer the logs to a new plate and immediately place them in the refrigerator. Once they’ve chilled through, slice them crosswise as thinly as possible using a large, thin, sharp knife or a mandolin (see the photo below). If the shrimp chips aren’t thin enough, they won’t puff up properly and will be too tough to eat after deep frying. 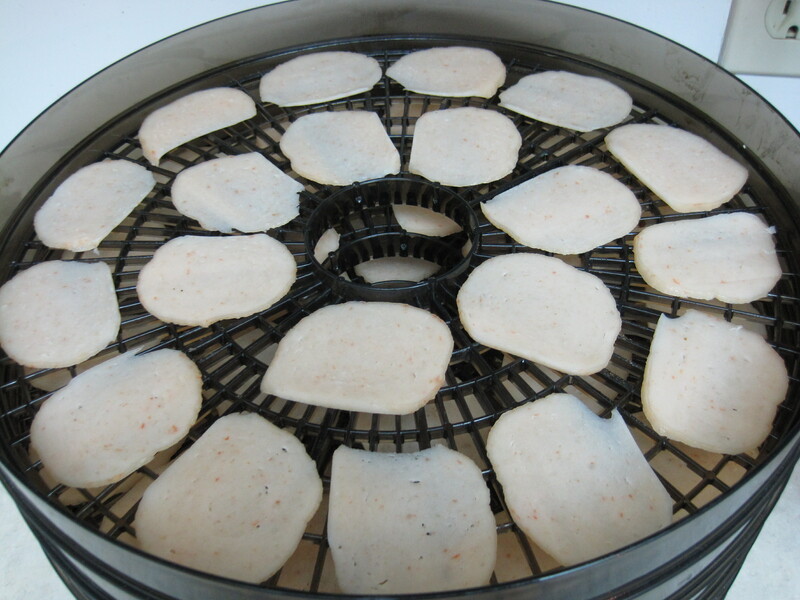 Place the slices of shrimp chips in a food dehydrator in a single layer (see photo below left). 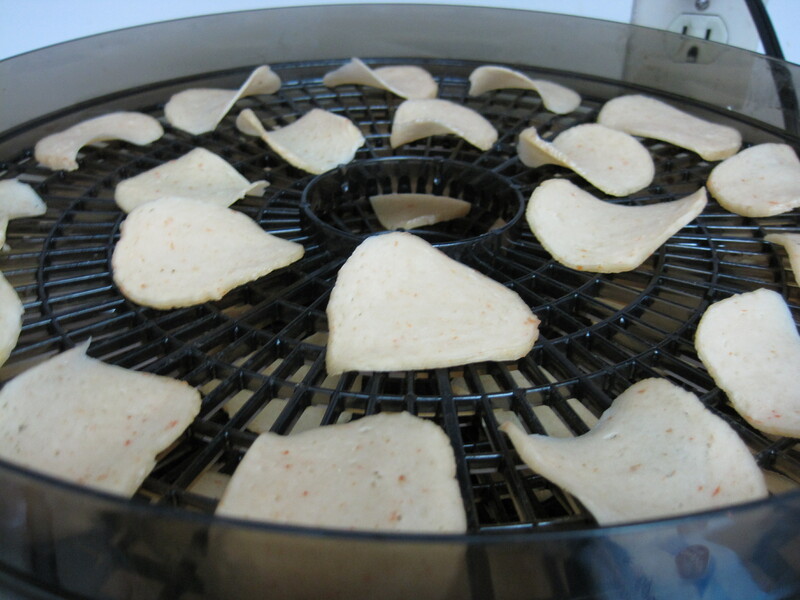 Dehydrate the shrimp chips until completely dried out, about 24 hours. They will curl slightly (see photo below right). These dried shrimp chips can be stored in an airtight bag or container at room temperature for a few months. When you’re ready to enjoy them, preheat the oven to 150 degrees F. Spread out the shrimp chips over a baking sheet and bake them until they are heated through, approximately 10 minutes. Then heat up vegetable oil 2 inches deep in a wok or large pot over high heat (I suspect the temperature is between 350F and 375F). Test the temperature of the oil by placing one shrimp chip into it. If the oil is hot enough, little bubbles will immediately form around the shrimp chip. Within seconds, it should puff up, enlarge, and float to the top. They expand quite a bit. When the colour of the shrimp chip is consistent throughout, it is done. Immediately remove it from the oil (I use a Chinese brass wire mesh strainer) and transfer it to a brown paper bag lined plate. Do not allow the shrimp chips to brown at all, as they will taste burnt. The cooking process happens within seconds, so watch them carefully and don’t deep fry too many at a time. Shrimp chips are best when eaten the day they’ve been deep fried. I’m wondering what heppena if you don’t bake them before deep frying. Just frying from the dehydrated state… does that work? Hi Andrew! Thanks for your question! I think if you skip the baking step, the chips would need more time in the oil meaning they would burn or be too hard.